“Zodiac le Plume” was originally part of The Sanguine Gryphon’s Spring 2011 pattern collection, and is now available directly from the designer. Swirls and curls created by little pin pricks of light floating across a solid field, flit and flutter, combining and intertwining to give the impression of uncontrollable chaos. Only by prolonged and careful observation will order eventually emerge and the secrets of the stars unveil themselves. 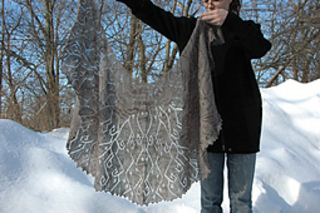 Zodiac le Plume is a crescent shaped shawl with organic patterning that draws inspiration directly from the sinuous lines and shapes which characterize the Art Nouveau movement. 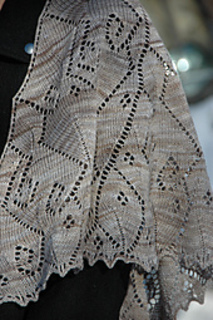 Skills Used: cable cast on, knitting and purling, k2tog, k2togtbl, k3tog, k3togtbl, sk2p, ssk, yo, decrease bind off, weaving in ends, and blocking lace.